Welcome to the Website of HJC Engineering N.V. Whether your plans include new construction or renovation, we have the resources to help you make the right decision. By choosing the optimum Architecture and Structural systems, with the assistance of our consulting team, you can design success into your project! During construction there are several things that could go differently than as planned during the design stage of a construction project. HJC Engineering N.V. will be able to assist you in avoiding the pitfalls and headaches commonly associated with construction projects. 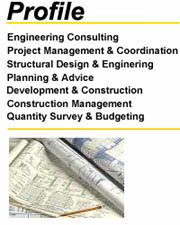 We will assist you in preparing an accurate and balanced budget estimate of material and labor for your project. This way you will be able to have a good view of the project costs also allowing you more control over your contractor. © 2009, HJC Engineering N.V.